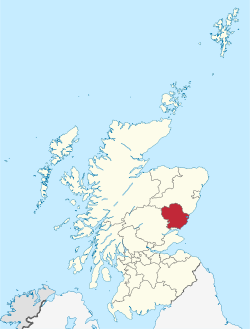 Angus was historically a county, known officially as Forfarshire from the 18th century until 1928. It remains a registration county and a lieutenancy area. In 1975 some of its administrative functions were transferred to the council district of the Tayside Region, and in 1995 further reform resulted in the establishment of the unitary Angus Council. The area that now comprises Angus has been occupied since at least the Neolithic period. Material taken from postholes from an enclosure at Douglasmuir, near Friockheim, about five miles north of Arbroath has been radiocarbon dated to around 3500 BC. The function of the enclosure is unknown, but may have been for agriculture or for ceremonial purposes. Bronze age archaeology is to be found in abundance in the area. Examples include the short-cist burials found near West Newbigging, about a mile to the North of the town. These burials included pottery urns, a pair of silver discs and a gold armlet. Iron Age archaeology is also well represented, for example in the souterrain nearby Warddykes cemetery and at West Grange of Conan, as well as the better-known examples at Carlungie and Ardestie. The county is traditionally associated with the Pictish kingdom of Circinn, which is thought to have encompassed Angus and the Mearns. Bordering it were the kingdoms of Ce (Mar and Buchan) to the North, Fotla (Atholl) to the West, and Fib (Fife) to the South. The most visible remnants of the Pictish age are the numerous sculptured stones that can be found throughout Angus. Of particular note are the collections found at Aberlemno, St Vigeans, Kirriemuir and Monifieth. Historically Angus shared borders with Kincardineshire to the north-east, Aberdeenshire to the north and Perthshire to the west. Southwards, it faced Fife across the Firth of Tay. Angus is marketed as the birthplace of Scotland. The signing of the Declaration of Arbroath at Arbroath Abbey in 1320 marked Scotland's establishment as an independent nation. It is an area of rich history from Pictish times onwards. Notable historic sites in addition to Arbroath Abbey include Glamis Castle, Arbroath Signal Tower museum and the Bell Rock Light House. In the 2001 census the population of Angus was recorded as 108,400. 20.14% were under the age of 16, 63.15% were between 16 and 65 and 18.05% were aged 65 or above. Of the 16 to 74 age group, 32.84% had no formal qualifications, 27.08% were educated to 'O' Grade/Standard Grade level, 14.38% to Higher level, 7.64% to HND or equivalent level and 18.06% to degree level. The most recent available census results (2001) show that Gaelic is spoken by 0.45% of the Angus population. This, similar to other lowland areas, is lower than the national average of 1.16%. These figures are self-reported and are not broken down into levels of fluency. Historically, the dominant language in Angus was Pictish until the sixth to seventh centuries AD when the area became progressively gaelicised, with Pictish extinct by the mid-ninth century. Gaelic/Middle Irish began to retreat from lowland areas in the late-eleventh century and was absent from the Eastern lowlands by the fourteenth century. It was replaced there by Middle Scots, the contemporary local South Northern dialect of Modern Scots, while Gaelic persisted as a majority language in the highland Glens until the 19th century. Scottish English is now increasingly replacing Scots. Angus Council are planning to raise the status of Gaelic in the county by adopting a series of measures, including bilingual road signage, communications, vehicle livery and staffing. Angus Council is one of the 32 local government council areas of Scotland. In 1996, the two-tier local government council was abolished and Angus was established as one of the replacement single-tier Council Areas. Prior to 1974 the county had been served by Angus District Council and Tayside Regional Council. As of May 2017 there are 28 seats on the council. From the May 2017 elections the seats are held as follows — Independent 9, SNP 9, Conservative 8, Liberal Democrat 2. The council's civic head is the Provost of Angus. There have been five Provosts since its establishment in 1996 — Frances Duncan, Bill Middleton, Ruth Leslie-Melville, Helen Oswald and Alex King. On 16 May 2017 a new provost will be appointed from the councillors elected in Angus at the 2017 elections. As Angus is a county area the Lord Lieutenant of Angus is separate role. The council has had four Chief Executives since its formation — Sandy Watson 1996–2006, David Sawers 2006–2011, Richard Stiff 2011–2017 and Margo Williamson 2017 to date. Margo Williamson is the first female Chief Executive since the Council was formed. The council's main offices are located at Angus House at Orchardbank in Forfar and at Bruce House in Arbroath while council meetings are held in the Town and County Hall in central Forfar. The council's offices include the historic County Buildings in Forfar adjacent to the Sheriff Court. The boundaries of the present council area are the same as those of the historic county minus the City of Dundee. The council area borders Aberdeenshire, Dundee City and Perth and Kinross. As of 2018[update] Angus is divided into 25 community council areas and all apart from Friockheim district have an active council. The areas are: Aberlemno; Auchterhouse; Carnoustie; City of Brechin & District; Ferryden & Craig; Friockheim & District; Glamis; Hillside, Dun, & Logie Pert; Inverarity; Inveresk; Kirriemuir; Kirriemuir Landward East; Kirriemuir Landward West; Letham & District; Lunanhead & District; Monifieth; Monikie & Newbigging; Montrose; Muirhead, Birkhill and Liff; Murroes & Wellbank; Newtyle & Eassie; Royal Burgh of Arbroath; Royal Burgh of Forfar; Strathmartine; and Tealing. Angus is represented by three MPs for the UK Parliament. Angus — covers most of the council area, is represented by Kirstene Hair of the Conservative party. Angus is represented by two constituency MSPs for the Scottish Parliament. Angus North and Mearns — covers the north of Angus and a southern portion of Aberdeenshire, is represented by Mairi Evans of the Scottish National Party. Angus South — covers the south of Angus, is represented by Graeme Dey of the Scottish National Party. Angus can be split into three geographic areas. To the north and west, the topography is mountainous. This is the area of the Five Glens of Angus, which is sparsely populated and where the main industry is hill farming. To the south and east the topography consists of rolling hills bordering the sea. This area is well populated, with the larger towns. In between lies Strathmore (the Great Valley), which is a fertile agricultural area noted for the growing of potatoes, soft fruit and the raising of Angus cattle. Montrose in the north east of the county is notable for its tidal basin. 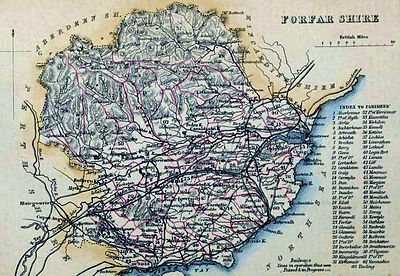 c.1854 Angusshire (Forfarshire) Civil Parish map. ^ Kendrick, Jill (1995). contributions by Barclay, Gordon J.; Cowie, Trevor G.; Saville, Alan; illustrations by Townshend, Angela; Braby, Alan. "Excavation of a Neolithic enclosure and an Iron Age settlement at Douglasmuir, Angus" (PDF). Proceedings of the Society of Antiquaries of Scotland. 125: 29–67. Archived from the original (PDF) on 11 June 2007. ^ Jervise, Andrew (1863). "Notice of stone cists and an urn, found near Arbroath, Forfarshire" (PDF). Proceedings of the Society of Antiquaries of Scotland. 5: 100–102. Archived (PDF) from the original on 11 June 2007. ^ Watkins, Trevor (1978). contributions by Barclay, G. "Excavation of a settlement and souterrain at Newmill, near Bankfoot, Perthshire" (PDF). Proceedings of the Society of Antiquaries of Scotland. 110: 165–208. Archived (PDF) from the original on 11 June 2007. ^ Jervise, Andrew (1863). "An account of the excavation of the round or "bee-hive" shaped house, and other underground chambers, at West Grange of Conan, Forfarshire". Proceedings of the Society of Antiquaries of Scotland. 4: 429–499. Archived (PDF) from the original on 11 June 2007. ^ Gaelic Language Plan 2014-2019 (PDF) (Report). Angus Council. 17 September 2014. ^ "Find your community council". Angus Council. Retrieved 7 January 2018. ^ Wilson, John Marius, Rev. (1854). Imperial Gazetteer of Scotland. Vol. I. A. Fullarton & Co. p. colour image preceding page 671. ^ "Welcome to Glamis Castle". Glamis-Castle.co.uk. ^ A Review of Angus Council's "Angus in China" Initiative and "Sister Area" Agreement with Yantai (PDF) (Report). Angus Council. 15 November 2001. ^ "Most Common Surnames in Angus". Forebearers.co.uk. 1881. Wikimedia Commons has media related to Angus.